To clear the previously defined action, click X. Now you can choose a different one. This action allows an agent to add numbers to a specific Do Not Call (DNC) list. As a result, campaigns that use that DNC list never call the number again. As a best practice, scripts should provide agents with this option as a courtesy to customers, as well as to comply with applicable legal requirements. Click Scripter.Add to Do Not Call List. This action takes two arguments. Select the Do Not Call list list to add the contact to. In the Phone Number box, insert the number you want to add to the DNC list. If you are configuring a component action, click Select. If you are configuring this action in the action editor, click Add Step. This action transfers the interaction to a number, queue, or user so that agents do not have to remember where to transfer interactions. Interpolated Text: Enter a phone number. For example, 317-555-5555. Note: If you enter an invalid number, PureCloud still attempts to make the transfer. This action consult transfers the interaction to a number, queue, or user so that agents do not have to remember where to transfer interactions. In a consult transfer, the transferring agent talks to the transfer recipient before transferring the call. This action passes the current call to a secure IVR flow action, so that the customer can enter sensitive information. After the system collects the sensitive information, you can return the customer to the agent and the script in progress. Or, you can end the agent script session when the call passes to the secure flow. Add a component that supports actions—a button for example. For the component's click or change action, click No Action Selected. A list of actions appears. From the Secure Flow box, select a flow. 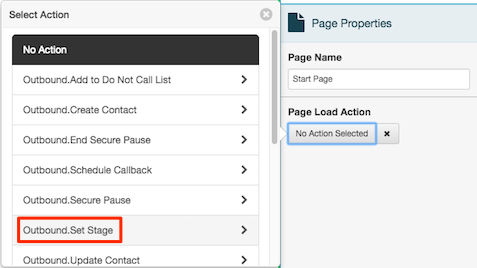 Use Return After Flow Completion settings to control whether the call returns to the agent or not. The default is No, meaning that the script ends and the system disconnects the agent from the call when the call passes to the IVR. By setting the switch to Yes, you can configure the action to return the call to the agent and script after the flow completes. 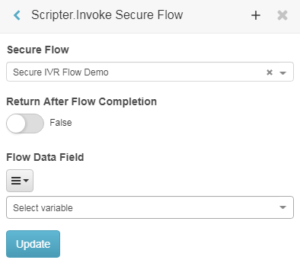 From the Flow Data Field list, choose the variable or text that passes from the script to the secure flow. Information that you pass to the secure flow is available in the Architect Flow.InvocationData read-only string variable. Click x to dismiss the Select Action popover. Type a URL. 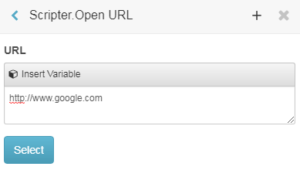 Or, to send an email, enter an address in the format mailto:username@domain.com. If an ad or pop-up blocker blocks this action at run time, a notification informs the user that it blocked the action. You cannot schedule callbacks more than two weeks in the future. Prompts for the ID of the agent that the contact would prefer to talk to when the callback is placed. A common practice by script designers is to set this argument to the Scripter.Agent ID variable, so that the agent who originally spoke with the contact is the agent the system tries to acquire for the callback. 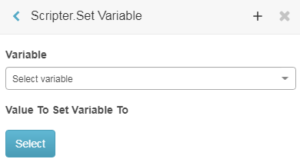 Select a variable from the Variable list. If there are no variables in the list, see Add a variable. Use the toggle switch to assign a Yes or No value. Outbound actions appear when you enable the script’s Outbound property, indicating that the script is for use by an outbound dialing campaign. Outbound actions perform campaign-related tasks, such as setting the value of a contact column, entering a call stage, or scheduling a callback to the contact. 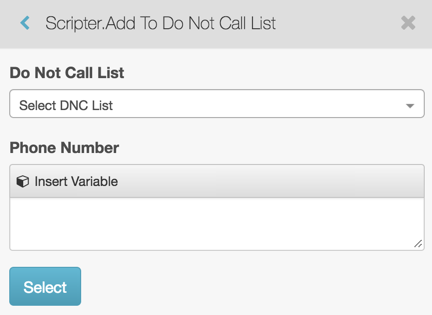 This action adds the current contact to the first Do Not Call (DNC) list assigned to the campaign. As a result, the campaign and any others that use that DNC list never calls the contact again. As a best practice, scripts should provide agents with this option as a courtesy to contacts, and also to comply with applicable legal requirements. Click the button icon on the component toolbar. To set the button action, expand the Advanced property group. Click the No Action Selected button below Click Action. Select Variable from the list. The Fields option allows you to assign a customer variable to any field of the object. But because you want to bind the value of a control to a contact column, select Variable. In the Name box, type a descriptive name for the variable (MyNewContact for example). Optionally, fill in a description. Leave the default value blank. To dismiss the Outbound.Create Contact popover, click X. At this point, the new object variable MyNewContact contains variables that correspond to each column in the contact list. Add a read-only text component to the page. Type First Name: as its label. Tip: The width property of this component is set to use all available horizontal space. To make it shorter, expand Layout. Then change Width to px. The width sets to 100 pixels by default, which is more appropriate for a label. Add a text input box. On the Common tab in the component properties, click Select Variable. 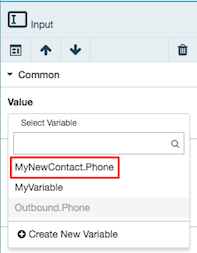 Notice that the variable list contains a "MyNewContact" object variable for each column in the contact list. In the example shown, MyNewContact.Phone is listed. The names of your variables mirror the actual names of columns in the script's associated contact list. The key point to remember is that the special variables are prefixed by the name of the object variable you created when the action was assigned. Click MyNewContact.FirstName. Notice that the text box is now bound to the Outbound.FirstName variable. Finally, click to select the Submit button. Then click the Move Down arrow repeatedly until the Submit button moves below the text boxes. A Schedule Callback action is an agent-originated request to call a contact back at the date and time stored in the action's associated string variable. Use date input and button components together to add a Schedule Callback option to your scripts. Select a variable from the Value list. To create a variable, select Create New Variable. 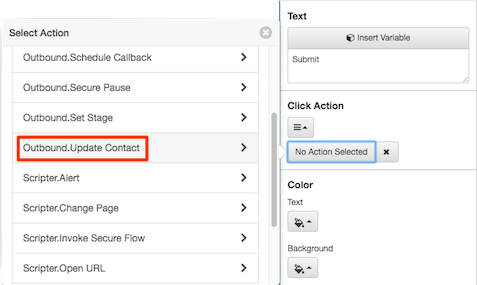 Configure the button's Click Action as a schedule callback action. Configure that action to reference the same variable set by the date input component. The Set Stage action sends a stage name to the outbound dialing system. Predictive mode campaigns analyze the time agents spend in each stage to calculate when and how many calls to place. For this reason, every predictive mode script should invoke a set stage action whenever the agent transitions to a new activity within the call. You can name stages anything you like, as long as each stage name is unique within your script. A predictive dialing campaign automatically compiles metrics for each stage, such as the length of time agents require to complete that portion of a call. By dividing a script into stages, an outbound campaign can more accurately predict when it places calls. 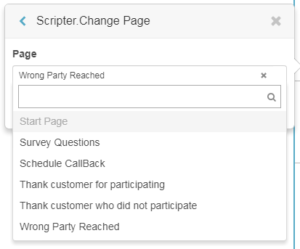 Predictive campaigns automatically use stages set by a script. You do not have to configure anything for the campaign, except that it uses predictive dialing mode. The rest is automatic. Click the Page icon. A list of pages in the script appears. Click the name of a page. The page opens in the editor. 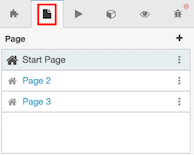 Open the menu for the page and select Properties. Under Page Load Action, click No Action Selected. Scroll the list of actions and locate the set stage action, then click Outbound.Set Stage. Type a name in the Stage box and click Select. The name can be anything you like, provided it is unique within the script. Repeat this process for each script page that should signal a stage transition. This action commits contact list edits that an agent makes. It sends the values of components bound to contact list columns to outbound dialing, and then updates the contact record. To add a button component, click the Button icon on the component toolbox. Click Common in the properties panel. Then click No Action Selected. The Outbound.Update Contact popover appears. This action does not have arguments to configure. This action allows a script to query data from an outside data source. Typically the outside data source is a CRM or database application. A script can also use this action to pass information collected by the agent to a database or CRM, if the web service supports it. Data actions are not available by default. You must enable the Data Actions script property. To update a data source using the Web Services Data Dip connector, the web service must be implemented with POST endpoints specifically for this purpose. Data returned to a script from a data action must be in a compatible format. Currently, scripts cannot read data from a JSON array. Some fields returned from Data Dip connectors may currently be inaccessible. To use a script with Bridge actions, agents need Integrations > Action > View and Execute permissions. Script designers also need View and Execute permissions. To add a data action to a script, designers don't need Add, Delete, and Edit permissions. The designer only needs those permissions to add, edit, or delete a data source. See Products, roles, and permissions list. Add a button or other component that supports actions. 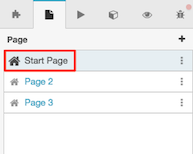 Or, use a page load action to invoke the data action. 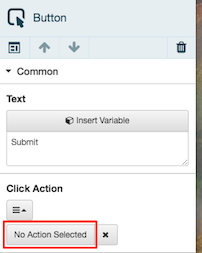 Choose Data Actions.Execute Data Action from the actions popover. Fill in necessary inputs using variables, static values, or interpolated text. Note: The system prompts you to enter input items required by the action. Different actions accept different inputs. Under Output, optionally create and then assign a variable to each item of data retrieved by the action, if any. When the action runs, it submits the request with all necessary input values, and then loads the resulting data, if any, to the output variable. The script can use the output variable to display the results. See Use braces to display variable values. Tip: Data actions cannot be simulated when previewing a script. The system displays a toast message indicating which action it invokes. When you preview a script, the system assigns no data to an output variable. User to User Information (UUI) is exchanging or passing data that is unrelated to the call from one application to another. This action updates User to User Information (UUI) associated with the interaction. Create an action that define custom multistep actions that execute after evaluating criterion. Click Add action. The Custom Action Editor appears. See Define a custom action for instructions.